Integral frame in recyclable technopolymer, in air moulding reinforced with fibreglass. For indoor/outdoor use. Stackable. 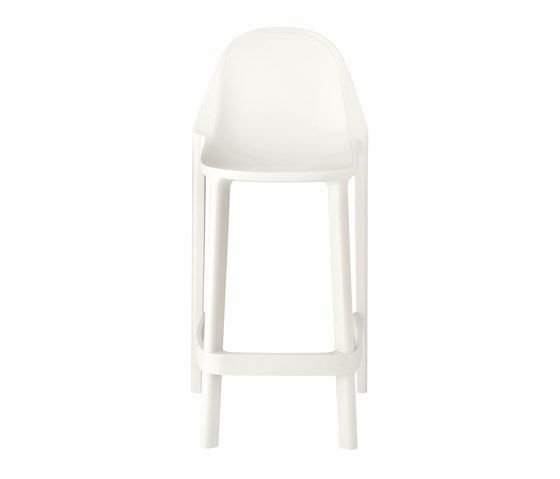 The barstool is available in two heights: h.65 and h.75. Più meets offers the highest level of style, shape and technology for use in contract furnishing. A whole family of products comes to life: the Più chair, armchair and barstool express added beauty and character. The techno-polymer accentuates the soft curves of the chair and transforms the design into comfort and practicality. The armless model is very practical when space is a problem: up to 10 chairs can be stacked, perfect for reducing clutter in business settings. Whether next to a counter, at the tables of your locale or as a bold statement of style in an elegant restaurant, Più always finds the shape that best suits for your needs.